A tree service is often needed when there are certain trees that need to be added to a landscape, to be removed from its existing spot and moved to another, to be trimmed, or, perhaps, to be pruned. However, we at Four Seasons Landscape Management offer more than the basic list of tree services in Georgia, such as pest control and fertilization. We have ISA-certified arborists who possess the necessary knowledge to handle any type of tree issues and needs, so you can definitely be sure that every service conducted is safely and efficiently done. Consultation - This is for tree management with regard to a tree's health, value, or risks. Fertilization - Most residences and commercial spaces have soil types that are not as mineral and vitamin rich as that of a natural forest. Therefore, fertilization is needed to maintain their health. Bracing - Providing supplemental support for branches in danger of getting broken. Tree Risk Assessment – Part of our tree service is providing risk assessment. We conduct ocular inspections to check if a tree could pose some risks or dangers in the future. Landscaping - Provide conceptualized or customized addition or planting of trees to work with a certain landscape design or theme. Pest Control - Just like any living thing, trees are prone to pests and diseases. We provide assessments, treatment, and prevention measure for these. 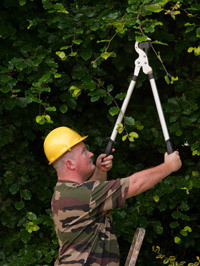 Pruning - Cutting or trimming away leaves or branches to prevent accidents and damaging other structures in an area. This is also performed to get rid of sick branches to prevent the disease from spreading throughout the whole tree and other nearby trees. Removal and Relocation - Provide services to remove a tree completely or to transfer it to a more appropriate spot. All the tree services we offer could not be done effectively and efficiently without the proper tools and equipment. Our arborists are trained to use and operate such with great proficiency. 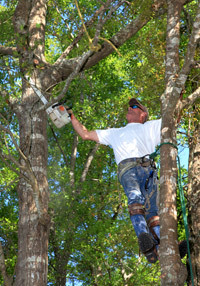 We only make use of the best tools and equipment for easy and fast completion of any tree-related services. Also, we have enough manpower to conduct even the most complicated tree service you may need. For additional information, or a free quote regarding the various tree services that we offer, we are just a call away.